Okay. I’m just gonna say it. I prefer British Psylocke over Ninja Psylocke. There. I did it. Psylocke was a part of my favorite X-Men era, the Australian Outback X-Men. I liked her new armored costume during that time. Just recently learned Art Adams designed that costume. Now, I’m not against Ninja Psylocke. She’s great in Uncanny X-Force. I just like Betsy Braddock more before she went through the Siege Perilous and came out the other side as a ninja. And when they brought in Revanche and had this whole “who’s really who” conundrum… Well. I’m still confused. Maybe I was over-thinking it and someone can break it down for me in a few simple sentences. Anyone? 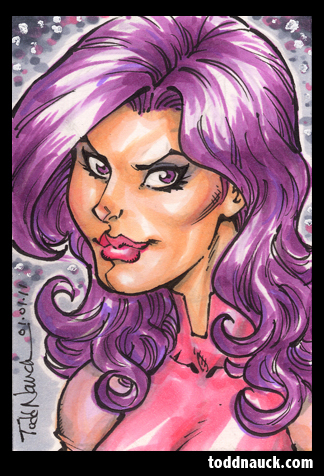 This entry was posted in Marvel, Sketch Cards and tagged comics, copic, pigma micron, psylocke, sketch card, superhero, x-men by Todd Nauck. Bookmark the permalink. At conventions, my commission sketches are head/bust shots, single character penciled/inked on 7″x10″(ish) art board (or sketchbook/blank cover comic) for $40. I don’t take a list, so get in line early! I know a lot of folks who still love Betsy back when she was a Brit– especially drawn by Alan Davis. Honestly, I don’t think even the writer who wrote it knows which Betsy was the real deal! I’m with you, Todd — I always enjoyed the rather girly/pampered/butterfly Betsy. Nothing wrong with psi-ninja, but, ho-hum, psi-ninja (in swimsuit, no less). I am a writer and new blogger in Las Vegas, and I am currently doing reviews on books and comics that have strongly influenced me. Having reviewed several classic sci-fi/fantasy novels, I’m about to launch my first comic review and want to talk about Wildguard (loved it, have two sets–one for each alternate cover–and the graphic novel edition). I wanted to find out if you have any plans to continue beyond the six-issue series and few stand-alone comics you have done for Wildguard; I’d love to post good news on my site. Review posted-let me know if I should make any changes (in case of Too Much Information).